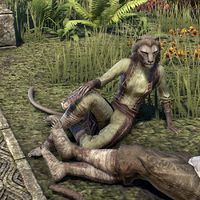 Hulinda-la is a Khajiit who can be found in Mistral. She is found near the Chancery, sharing some private moments with Yan. Hulinda-la: "Oh Yan, how was it we came to find each other? You, a herdsman, me, the daughter of a great merchant?" Yan: "Two moons smiled on us, and danced us across ja'Khajay [sic]. And now, once we are wed …." Hulinda-la: "Once mother approves, you mean?" Yan: "Of course, love! How could Yan forget? Once … once we are together, we bring our dance to the world, yes? On one of your father's finest ships!" Hulinda-la: "It will be wonderful, my dear. But come, you must speak with mother. Surely we cannot marry without her consent?" Yan: "Of … of course, my love! N-next time we see her, she will know all we plan, and we will ask her for her blessing! Huh … How could she say no?" Hulinda-la: "Your father, he will not miss you?" Yan: "No, all that long-whisker cares about is sheep. 'Where are they grazing, Yan?' 'What did you feed them?' 'Where did a little one wander off to?' It is a wonder his fur has not fluffed and coiled!" Hulinda-la: "But still, he provides for you, no? And your mother, before she …." Yan: "Yes. Yes, he is owed for that. And if not for him, we would not have met. We would not be so happy as we have come to be." Hulinda-la: "He will live with us then? Once we are wed?" Yan: "If your parents will have it, this one will not stand in the way." This page was last modified on 8 March 2019, at 09:41.